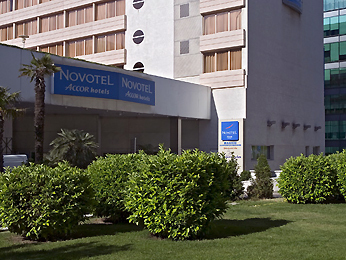 Enjoy the modern facilities at the Novotel Madrid Campo de las Naciones hotel. In a quiet area, the hotel boasts excellent access to Puerta del Sol, 30 minutes away by metro, and the IFEMA exhibition center, a 5-minute walk away. It is home to nine meeting rooms and rooms that boast a contemporary design with every comfort, including complimentary WiFi. After a day playing golf on the adjoining course, relax at the poolside bar or in the restaurant and enjoy the Mediterranean cuisine served at Novotel.